Please forgive me for again combining my posts today. I really do love my job but sometimes I just feel like I have to cram so much into the remainder of the day (which really feels like it should be my night!) and more times than not, I find that I just cannot do everything I set my mind to! I had a good day at work today…we stayed quite busy and I was rolling pitas, flatbreads and shicaccias til’ the last second. Before I left this morning I decided to snack on something a little different because lately I’ve been SO hungry ALL morning long…even after eating a larabar! Seriously…like aching hunger which doesn’t lead to good things (I might have been resorting to picking extra candied pecans off of sticky buns and chocolate chips off of cookies….maybe….shhhh). So, this morning I had a banana and chocolate peanut butter instead! It was a fabulous decision because it kept me satisfied ALL morning until I took a break at 7:45. I could have even gone longer but wanted to call Ryan before his 8:30 meeting. 🙂 I am proud to say I didn’t eat ONE candied pecan or piece of baked streusel! Score! I had my usual oats this morning made with half 2% milk (the kind my mommy buys) and half water and a scoop of chocolate almond butter. I didn’t cook it long enough though and it was a little on the soupy side—still good though! 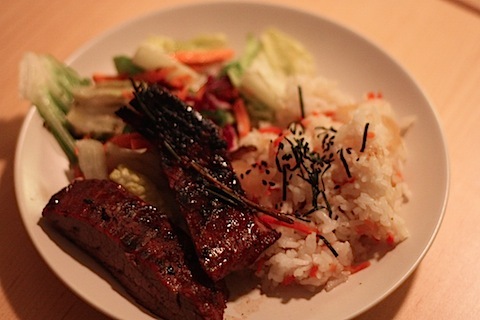 And then for dinner, I kept it simple ’cause tomorrow I’m goin all out (you’ll have to wait to see!). 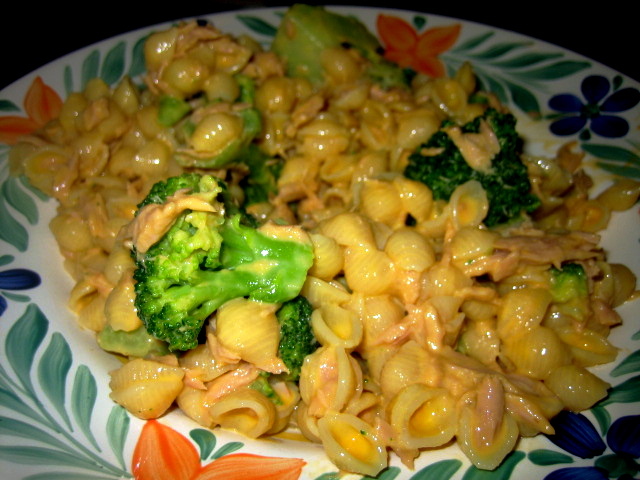 Annie’s mac & cheese with a pouch of chunk light tuna and broccoli. This hits the spot every time. I have a very weird week this week. Tomorrow I work and then I don’t actually work again until Saturday. I have to go to a training class (the title of the class is wellness through natural foods!) on Thursday night and then I got Friday off because Thursday will be a late night and not really conducive to waking up at 3 and going to work. Thank God my boss is so understanding! I’m cooking for my family and for Ryan tomorrow night and grocery shopping after work. I am making one of our favorite meals….you will have to be patient and I will post it tomorrow. With the recipe, of course! Your class sounds really interesting. Annie’s mac and cheese with tuna is such a good combo. I can’t wait to see what you have in store for dinner tomorrow!! Have a great day at work. Mmm, your cereal combo looks amazing. 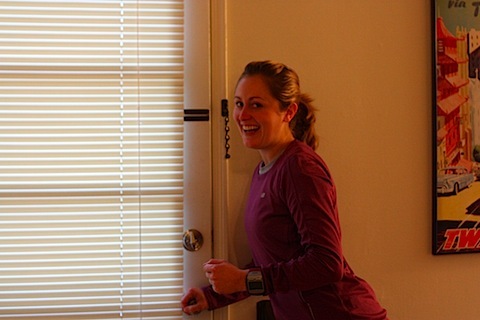 Of course that’s the first thing I noticed…Hi, I’m Shelby and I’m a cereal-holic! That dinner looks really yummy! Sometimes it is nice to take a day off of yoga and go for a nice long walk! I bet it was gorgeous in Tampa today. Enjoy your training class. That sounds really interesting! 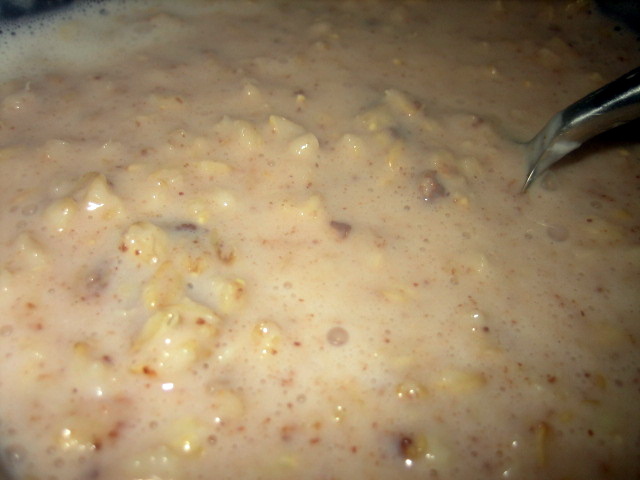 I love mac n cheese with mix ins, such comfort food!! Can’t wait to read about tomorrow night’s dinner!!! That banana + chocolate looks to DIE for. I also need a morning pick-me-up or else I starve, so I’ll definitely try out that idea. My two favourite flavours! I have to say I adore your bowl you used for your lunch AND that teacup. I know you have used that mug before…I love it!! Oh, and I love your chocolate pb nanner sammie, too. Have a wonderful night, Jenna! oh my that dinner looks divine. i’ve been craving mac and cheese nonstop lately. i don’t know what that’s about! oooh, that banana looks yummy! can’t wait to see the surprise meal!! That ‘naner looks soooo good! I need to get chocolate pnut butter! That Mac and Cheese ldoes look great. Don’t worry about cramming two blogs in one. I totally understand. I am just glad you check in everyday because I look forward to your posts. 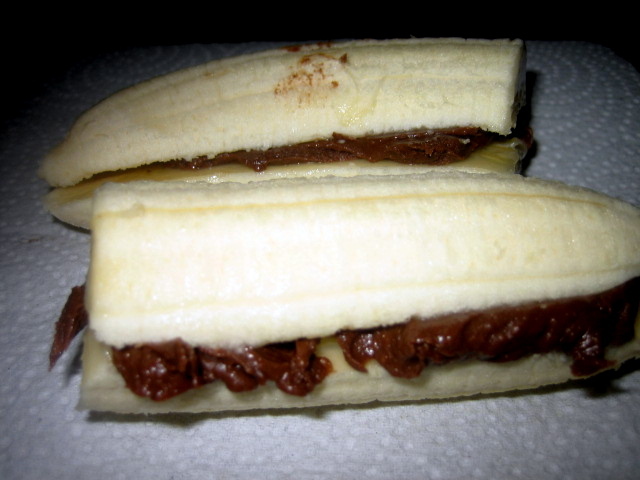 I love bananas and PB, I bet it tastes great with the chocolate PB. Good idea! The chocolate pb banana is gorgeous! What’s a Kashi bumper? Is it related to a Puffin? How much of the box of Annie’s do you eat at a time? I can easily eat the entire box in one sitting….I really try not to, but it’s so delicious! How many meals do you turn 1 box into? Thank you, Jenna!!!!!!!!! I just make the entire thing and then portion mine out with a big one cup scoop! 🙂 I could eat the whole box too!! haha! For some reason, I really love the title of this post. It made me happy. happy snacky! Can’t wait to hear about dinner tomorrow!! Can’t wait to see what you are going to make tomorrow! I just had overnight oats for the first time this morning I can’t believe how delicious they are! Wellness through Natural Foods sounds like it will be an interesting class. I’m anxious to hear about it. Love that Annie’s meal. I’m looking forward to seeing tomorrow’s! Love your delicious eats. And your mug is tooo cute!!! I had Annie’s last night and for lunch today….delish! Your combo with it sounds great though! Seeing your chocolate peanut butter reminds me that I need to go to the store and get some more!! That stuff is absolutely DELICIOUS! I hope your weird week goes well, girl! We understand! You’re in a new job-I can’t imagine how busy you are trying to figure out your new lifestyle!Although holy moly it’s only 9 in the am and your mac n cheese is making me REALLY hungry!!!! 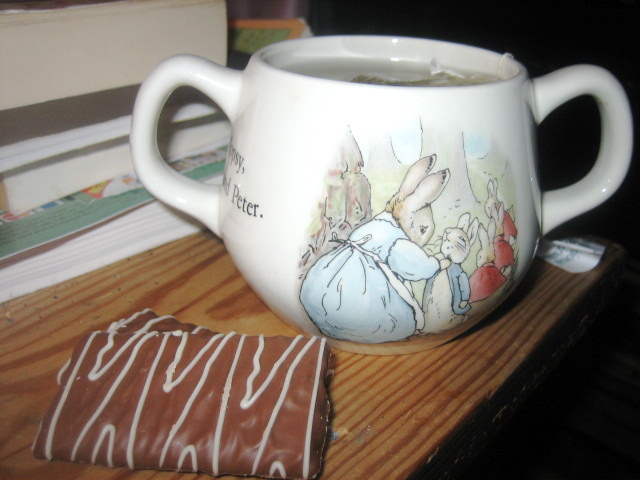 I drink tea almost every night and I love your Peter Rabbit mug. Those chocolate biscuits look dangerous. yum! Your dinner looks so good!! Can’t wait to see whats in store for tomorrows dinner. There is something about bananas and PB that definitely keep me fulling and moving for quite awhile. you’re not alone when you say you have to cram everything into the hours after work and never get all you want/need to get done, no matter what those hours may be. 🙂 I work a regular 9-5 day and by the time I get home after an hour long commute, make dinner, and walk the dogs, I feel lucky if I can throw in a load of laundry or sit to read for a minute before falling asleep. Its the nature of the beast of the working world unfortunately.